As parents, your feedback is invaluable to us in informing our decisions and plans moving forward. We invite you to share your feedback in this year's online parent survey. You should have received an email this week with the link to the survey. If you have not received the survey, please email Stephanie Green at sgreen@fairmontschools.com with your updated email address, and we will send it to you right away. Each family who completes the survey by June 10 will be entered in a raffle to win $1000 off tuition next year! Thank you for taking the time to share your thoughts. Anaheim Hills: Our amazing students entertained us with their wealth of talents and musical skills during the recent instrumental program. In September the Fifth Graders chose to learn how to play either violins, cellos, clarinets, flutes, trombones or trumpets. They have spent the past 9 months learning how to read music, about beat, about timing and playing with a group. They have learned how to take care of their instrument and about being dedicated to practice time. The improvement has been astounding! They thrilled us with their progress, and it was to wonderful to see how much they have learned. Junior High Instrumental group entertained us with their fun and jazzy music repertoire. We loved seeing them enjoying the music they had been learning. They played movie soundtracks like Pirates of the Caribbean and Raiders of the Lost Ark March. They also played Red Face and a jazzy blues song, and the flutes had a wonderful version of The Entertainer. Some of the Junior High students have been playing their instruments through Fairmont for four years! 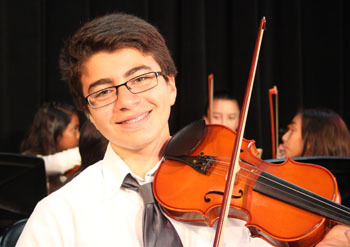 Historic Anaheim: On Wednesday, May 27, the Historic Anaheim Campus was filled with beautiful music. The eclectic mix of songs ranged from the Beatles' "Yesterday" to Beethoven's "Symphony No. 5." First off, the fifth grader strings class took the stage. They played several traditional songs including "Mary Had A Little Lamb." Their portion of the program concluded with "Twinkle, Twinkle, Little Star" by Mozart. Performing next were the brass and woodwinds classes from fifth grade. Their program consisted of folk songs from around the world. Additionally, their set featured two solo performers - Jason B. played a clarinet solo and Julia T. performed a piano solo. Justin L., Lauren L, and Michelle L. - Violin, Cello, and Piano Trio - "Part of Your World" from "The Little Mermaid"
Finally, the combined Elementary Ensemble and Junior High Orchestra took the stage. They performed several well known songs including "Yesterday" by the Beatles and themes from "Pirates of the Caribbean." Also included in their set was "Finale" by Beethoven and "Canon in D" by Pachelbel. The show concluded with the traditional closing number, "Can-Can" by Offenbach.